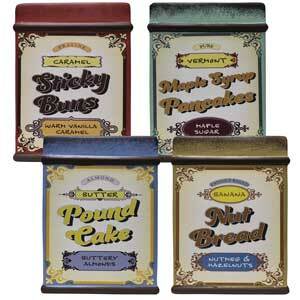 • 28 ounce candle in a resin, vintage style flour tin. • Up to 140 hour burn time. • Mix of four fragrances: Almond Butter Pound Cake, Banana Nut Bread, Maple Syrup Pancakes, Praline Caramel Sticky Buns. • 12 per case, $12.00 each.